I know there are a lot of Phil Hale fans lurking around conceptart, so i thought I'd chuck this up for folks to look at. It's pretty tame compared to Phil Hale's usual stuff, but as the only official painting of Tony Blair during his time as PM (10 years) it's quite an interesting piece of work. I'm sure people will make all sorts of judgements and interpretations of it, particularly with the lack of eye contact and the rather subdued setting and palette. Last edited by duddlebug; April 24th, 2008 at 05:17 AM. Reason: Added picture! I really like the composition, and what I find fascinating about this piece of work is how casual and inviting the pose is, due to the fact that we here in the U.S. don't usually get that kind of a vibe from our politicians. Kudos for Hale really nice piece of work. Wow, that's impressive! Thanks for posting this. It's a much more introspective portrait than I would than I would have thought Blair would've wanted, but very powerful. Great job Phil! He looks beaten...and worn out. And maybe even a little bit older as well. I like the little white triangle that sticks out in the middle. It's quite an excellent compositional element, but also really pushes, I don't know, a "unkempt" manner about the pose. Like he's done with presenting himself in the most polished way possible, as any political figure would have to be. Is it just me or does he have a really big forehead? Wow, that's pretty cool stuff. Though it is somewhat tame for Phil Hale, I think as regards typical political portraits it's very unorthodox. The usual seems to consist of a stiff pose either sitting or standing while facing towards the left and turning the head ever so slightly to look out at the viewer. Instead with Phil Hale's work, Tony Blair is portrayed firstly at a much more dynamic angle and secondly he doesn't even look out towards the viewer. Also Blair is portrayed, almost harshly, as tired and haggard. Blair in this portrait seems very much human while still retaining the impression that he is an important and powerful man. I dunno, maybe I'm babbling at this point but I find this portrait very fascinating. I can't stop looking at it. It's interesting the expectations one brings to a piece, depending on the context. For an official portrait, it's quite daring and complex. For a Phil Hale painting... meh. It looks to me like it was shot from an angle and cropped, probably to minimize glare (you can see some of the frame on the left side). I hope they release a better image. I thought perhaps it was because the artist's point of view is from slightly above the subject. This would cause foreshortening and emphasize the forehead. The only way to tell would be to see a properly executed studio photo of the painting, or better yet, see the original. If it's possible to visualize the weight of ten years in office, Phil Hale has done it. from what i understand this was a "paint me or you will cease to exist" situation. If Phil Hale disappears at any point in time we will know why. I think this is a very interesting image. Not at all what I expect of an official portrait. Interested that Phil Hale currently lives in London... Thanks for this Jonny. I wonder who they'll get to do an official of Gordon Brown? Cruikshank or Thomas Rowlandson? I respect Phil Hale as an artist and all, but how the hell did he miss Blair's giant devil horns and forked tail??? 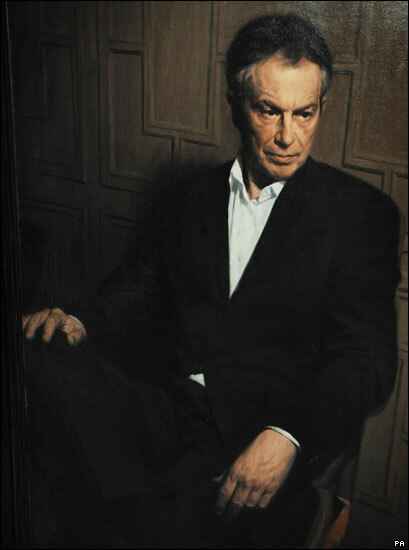 In its own way, especially compared to previous PM portraits, Hale's Blair is a radical picture. I like how he captured the humanity of Blair and his exhaustion. The informality of the lack of a tie is especially jarring. This portrait is like the Madame X of PM pix. and I checked out this thread hoping he'd used red gloss as body paint....! Hale's Blair is a radical picture. I like how he captured the humanity of Blair and his exhaustion. The informality of the lack of a tie is especially jarring. Don't think this video has been posted already: BBC interview with Phil Hale. I just don't understand some of the questions the man is asking. Any British who can translate? Phil hale is a legend of he´s own time! Love, love, love his work.